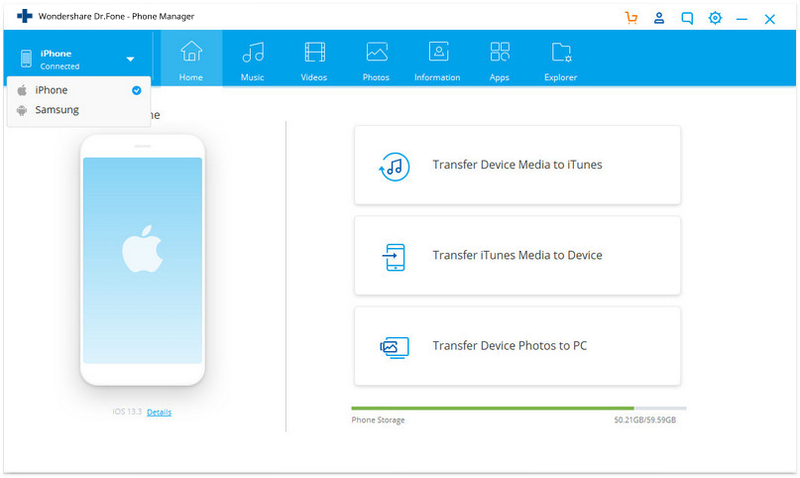 Transfers all data, including videos, messages, photos, etc., from iPhone to iPhone. Supports inter-iPhone, inter-Android, and iPhone-Android data transfer. Easy-to-follow instructions to guide you. Data kept intact and private during the transfer. Congratulations on getting a new iPhone! You must be really excited to try all of its amazing new features. Before you get going, the first thing that you probably want to do is to transfer data to new iPhone from your old one. It might surprise you, but there are lots of ways to transfer data from an old iPhone to the new iPhone. You can do it without experiencing any data loss or spending hours trying to figure out different iPhone transfer techniques. Read on to learn our top 5 tips on how to transfer everything from one iPhone to another. Want to get the most from the old iPhone after switching to new iPhone? You can check this post to know how to prepare iPhone for sale. Part 4. What if I Have to Transfer Data from Other Phones to iPhone? If you are a regular iPhone user, then you must already be familiar with iTunes and iCloud. If you mention an iPhone transfer service, a lot of people will first think of iTunes or iCloud. Well, this is where you might go wrong. Even though these services are developed by Apple, they can be quite complicated. Also, users can’t customize the way they wish to transfer their data between their old and new iPhones. In order to have a hassle-free experience, you can simply try the dr.fone toolkit. An extremely reliable and convenient solution, the dr.fone toolkit will meet all your smartphone-related needs. To learn how to transfer data to a new iPhone, you can use dr.fone – Switch or dr.fone – Transfer (iOS). 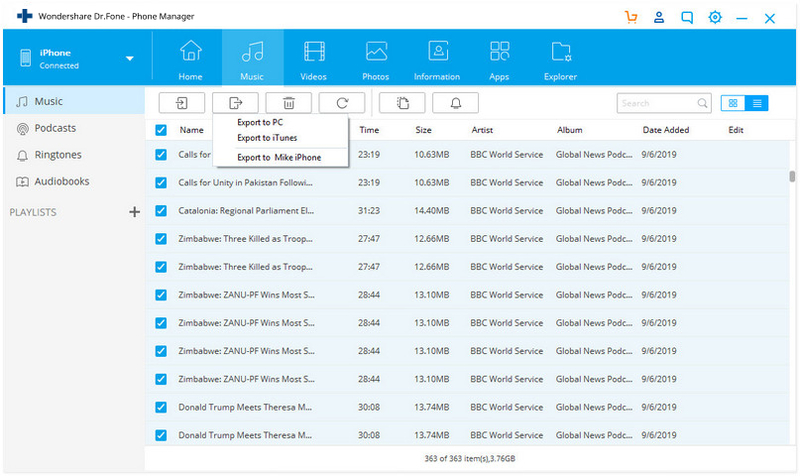 Developed by Wondershare, the toolkit is already used by millions of people around the world. The toolkit has a user-friendly interface and you don’t need any technical knowledge. dr.fone - Switch helps you to transfer Contacts, Messages, Calendar, Photos, Music, Videos, Notes, Bookmarks, Voicemail, etc to iPhone, while dr.fone - Transfer (iOS) enables you to transfer and manage iPhone Contacts, Messages, Music, Videos, Photos. Both the solutions are time-saving and will let you select the kind of data you wish to transfer to your new iPhone. The tool won’t access your data. Therefore, you can transfer your private information without worrying about any data leaks. It comes with a dedicated customer support. Yes, you read it right. With only a single click, you can easily transfer all your data from one device to another. To do this, simply use dr.fone – Switch. This dedicated and reliable tool can transfer your data from your old to new iPhone in only a few minutes. By following a simple click-through process, you can transfer all your data to your new iPhone. Here are some of the main features of dr.fone – Switch. 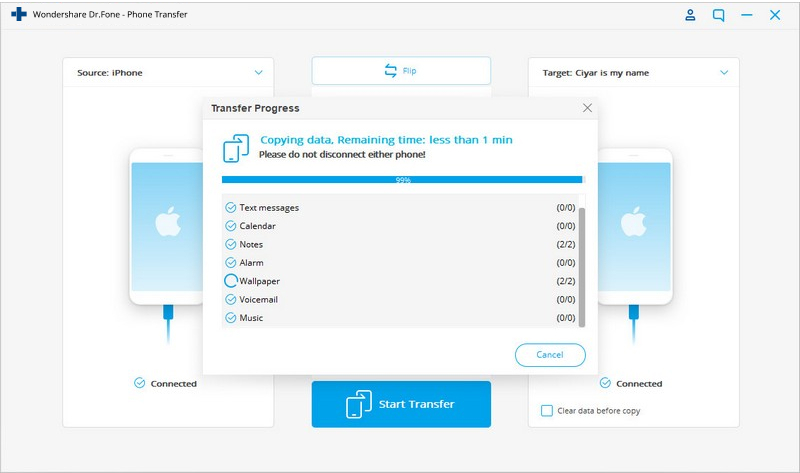 Transfer Everything from Android/iPhone to New iPhone in 1 Click. It supports all the leading iOS devices, including devices running on iOS 11. 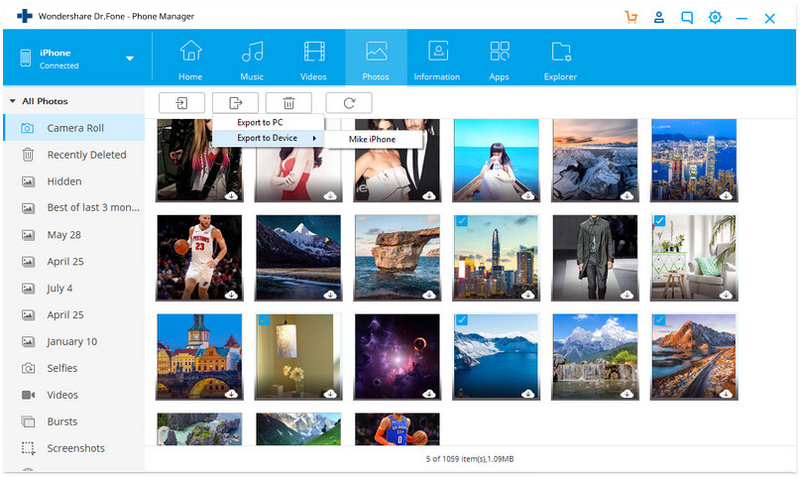 The tool can transfer your photos, videos, contacts, messages, music, call logs, notes, bookmarks, and so much more. You can transfer all your data or select the type of content you wish to move. It is compatible with Android devices as well. This means you can easily perform a cross-platform transfer (e.g. iOS to Android). Go to the official website of dr.fone – Switch and download the application on your Mac or Windows system. 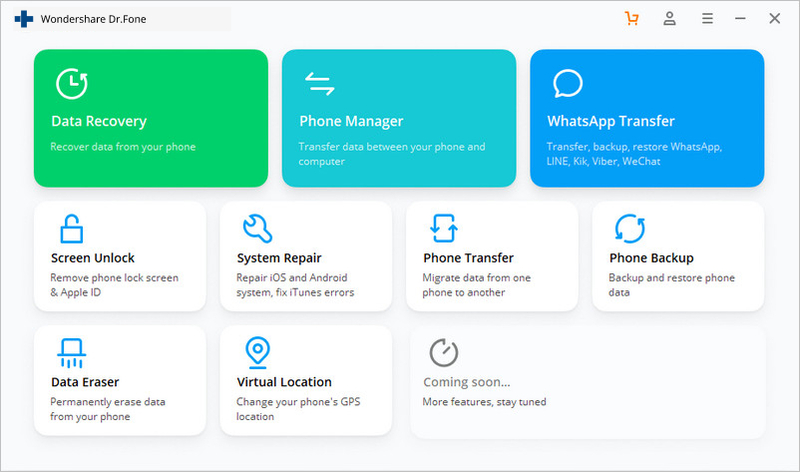 Launch the dr.fone toolkit on your system and connect both the old and the new iPhones. From the welcome screen, select the “Switch” option. Great! Now both the devices will be automatically detected by the tool. If you are connecting an iPhone for the first time, then you need to trust the computer. The application will provide a quick snapshot of both the devices. Make sure that your old iPhone is listed as the source device and the new iPhone is the destination device. You can click on the “Flip” button to interchange their positions. 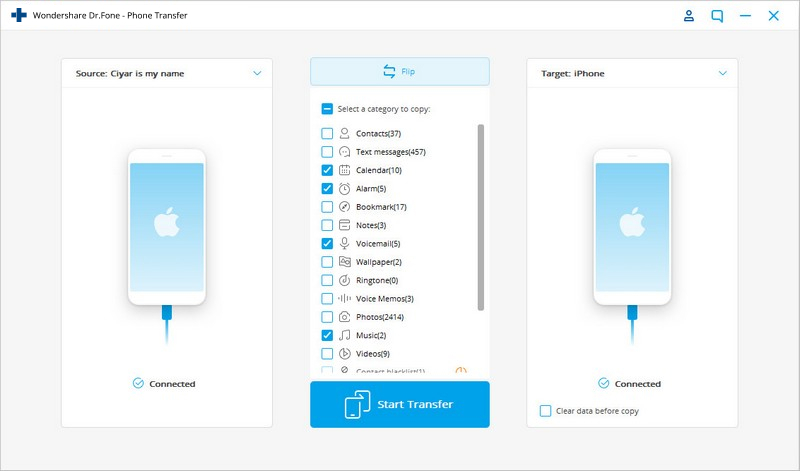 Now, select the data you wish to transfer to your new iPhone from your old one and click on the “Start Transfer” button. The application will automatically copy your data from your old to your new iPhone. Wait until the process is completed successfully and don’t disconnect your phones until then. As soon as the transfer process is completed, you will be notified. You can then safely remove both the devices. That’s it! By using dr.fone – Switch, you can learn how to transfer everything to your new iPhone from your old one with a single click. Another way to perform a seamless data transfer from one iOS device to another is by using dr.fone – Transfer (iOS). It is a complete iPhone manager and transfer tool that will greatly improve your smartphone experience. You can use it to manage your device, transfer iPhone data, access important files, and do so much more. This advanced tool will let you perform a selective transfer of data between different sources. Transfer data to new iPhone selectively. It can transfer data between an iOS device and computer, iTunes and an iOS device, and even between different iOS devices. It provides a preview of your device data so that you can selectively move it from one place to another. The user-friendly interface automatically segregates data into different categories. The tool will help you import, export, and manage your data. It can move your photos, videos, contacts, messages, music files, and so much more. Has an inbuilt file explorer. Compatible with every leading iOS device (iOS 11 supported). Launch the dr.fone toolkit on your system and open the “Transfer” module. Additionally, connect both your old and new iPhones to your system. Wait until both the devices are automatically detected by the application. Go to the top left corner of the application to check whether it has detected both the devices. Make sure that you have selected your old iPhone as the source device. The application has different tabs for each content type. To transfer songs, podcasts, Audiobooks and more, go to the “Music” tab. Here, you will find all the audio files listed in different categories. Select the music files that you wish to transfer and click on the export icon on the toolbar. From here, you can export the selected content to your new iPhone. To transfer photos, go to the “Photos” tab and select the album or the files you wish to move. Afterward, click on the export icon and select the “Export to Device” option. Choose your target iPhone from here. In the same way, you can transfer videos as well. To move your contacts and messages, go to the “Information” tab. From the left panel, you can switch between your messages and contacts. Select the messages or contacts that you wish to move. Click on the export icon and you will get different options to export the selected content. Choose to export the computer, and then import the saved file on computer to the target iPhone. In this way, you can transfer all kinds of data to your new iPhone without any trouble. You have to back up your whole device. 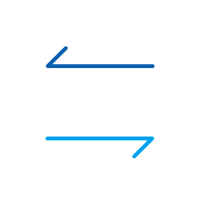 There is no ability to perform a selective transfer. Users often get unexpected iTunes errors and compatibility issues when transferring their data using iTunes. The process will erase the existing data on the target device. Launch an updated version of iTunes on your system and connect your old phone. Select the phone from the devices section and go to its summary. 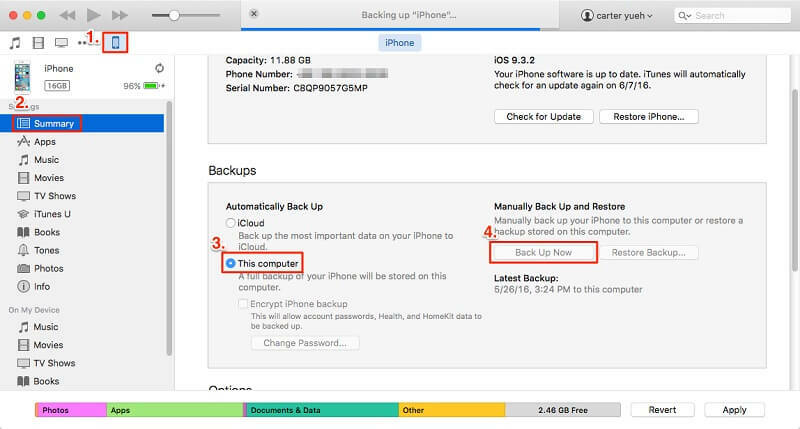 Under the backup section, choose to create a backup on “This Computer” instead of iCloud. 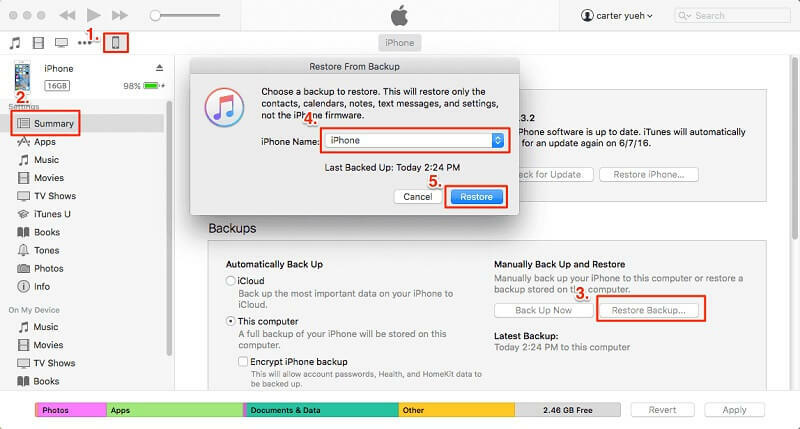 Click on the “Back Up Now” button to manually take a backup of your iPhone. This will save all the prominent data on your device in a backup file. Now, remove the old iPhone safely and connect the new device. Select your new iPhone and go to its Summary window. Under the Backup section, click on the “Restore Backup” button. A pop-up window will be launched. From here, you can select the recent backup that you wish to restore. Click on the “Restore” button and grant the computer permission on your device to automatically restore the backup. Even though this will restore the backup file, all the existing data on your target device will automatically be deleted. Two Ways to Restore from iTunes Backups? Another way to transfer data from one iPhone to another is by using iCloud. By default, every Apple user only gets a 5 GB of free space on iCloud. Therefore, if the data you wish to move is beyond this limit, then you need to buy more space on iCloud. This technique is quite similar to iTunes because it doesn’t allow us to selectively transfer our data. It is also a more time-consuming solution and will also use your Wi-Fi or network data. 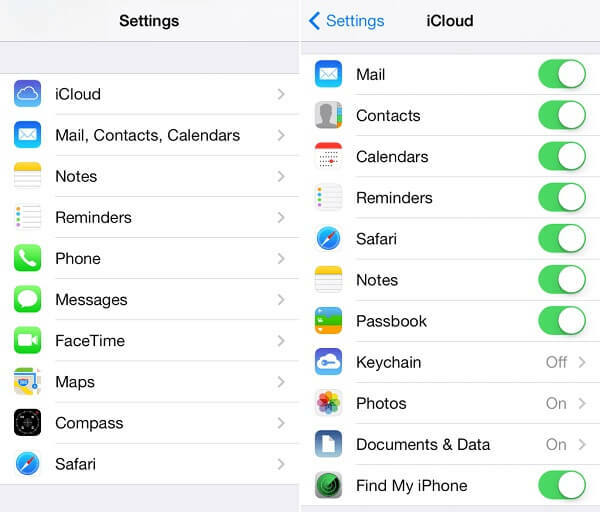 There are two ways to transfer iPhone data using iCloud. The best thing about iCloud is that you can easily sync your data with it. All you need to do is turn on iCloud data sync to initiate the transfer. Once your data is in the cloud, you can sync it back again on the target device. Sounds complicated? Don’t worry, it is quite simple. Just unlock your old iPhone and visit its iCloud Settings. From here, you can turn on iCloud sync for your contacts, messages, photos, notes, and more. Simply turn on the sync and wait until your data is available in iCloud. Afterward, follow the same drill and sync your data back to your new device. Just make sure that you are signed-in to the same iCloud account to sync everything successfully. Unlock your source device and go to Settings > iCloud > Backup. 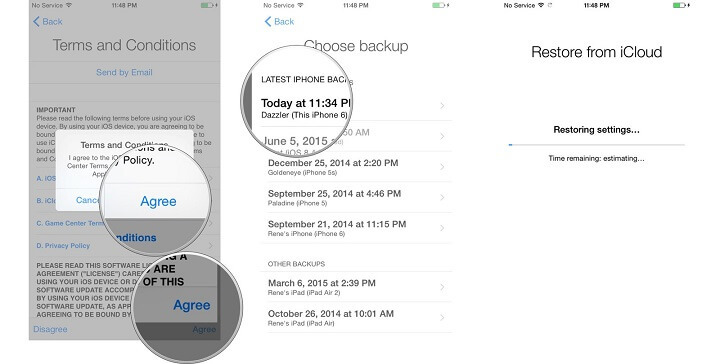 Turn the iCloud backup option on and tap on “Back Up Now” to create an immediate backup. Once you have successfully created a backup of your device, turn on your new iPhone. 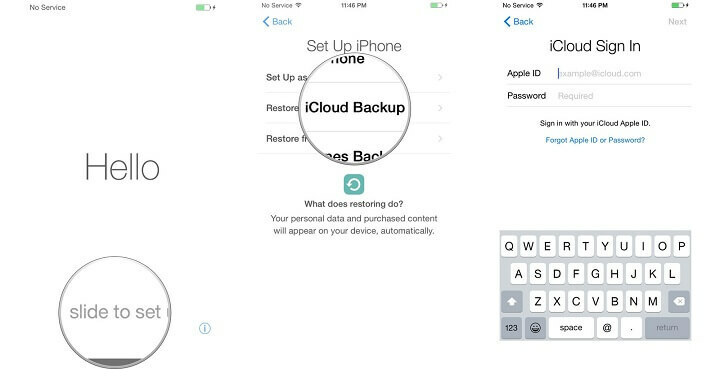 Slide the screen to begin setting up the device and choose to restore it from iCloud backup. To proceed you need to log-in to your iCloud account. Make sure this is the same account where the backup is stored. Agree to the terms and select the backup file you wish to restore. Wait for a while until your entire iCloud backup is restored to the new iPhone. After following these techniques, you can easily learn how to transfer data from one iPhone to another iPhone. If you wish to transfer your data from an Android or Windows device, then you can follow a similar approach. This is because the dr.fone toolkit supports a cross-platform transfer of data. Here are some informative guides that can help you do this. How to transfer data from Windows phone to iOS? You can also follow these useful tips to make sure that your transition from one iPhone to another will be a smooth one. Always maintain a backup of your iPhone data to avoid any unexpected data loss during the iPhone transfer process. Try to retain the same phone number while switching your device. Get in touch with your carrier for this. You can have the same number even when you are switching carriers. This can be done with an unlocked iPhone or by getting customer assistance from your carrier. Only use reliable software to perform a phone-to-phone transfer. Use a cloud service (besides iCloud) to maintain a backup of your data. If you are getting a jailbroken device, make sure you are aware of the consequences. There are different ways to transfer your data from one iPhone to another. Bear in mind that not every technique might give you the expected results. Some could be time-consuming while other solutions might ask you to reset your device first. If you don’t want to go through all this hassle, then simply try dr.fone – Switch or dr.fone – Transfer (iOS) and move to your new iPhone like a pro. Learn how to export contacts from iPhone to Excel in this quick guide. Three different methods are listed here to help you export iPhone contacts to CSV.